Liquid cooling, which can be achieved using indirect or direct means, is utilized in electronics applications having thermal power densities that may exceed safe dissipation through air cooling. Indirect liquid cooling is where heat dissipating electronic components are physically separated from the liquid coolant, whereas in case of direct cooling, the components are in direct contact with the coolant . Most desired liquid coolants’ for electronics cooling applications have good themophysical properties, high flash point and auto ignition temperature, compatible with materials of construction, good chemical and thermal stability, inexpensive, nontoxic and long shelf life. Good thermophysical properties for the liquid coolants are required in order to obtain both higher convective heat transfer coefficients and lower pumping power . Deionized water is a good example of a widely used electronic coolant for indirect cooling applications. Other popular non-dielectric coolant chemistries used in indirect cooling applications are propylene glycol, ethylene glycol, ethanol/water, calcium chloride solution, potassium formate/acetate solution and liquid metals such as alloy of gallium, indium and tin (Ga-In-Sn) . The electrical conductivity of the liquid coolant becomes important in a direct cooling application because of the contact between the coolant and the electronics . However, in indirect cooling applications the electrical conductivity can be important if there are leaks and/or spillage of the fluids onto the electronics. In the indirect cooling applications where water based fluids with corrosion inhibitors are generally used, the electrical conductivity of the liquid coolant mainly depends on the ion concentration in the fluid stream. Higher the ionic concentration, larger is the electrical conductivity of the fluid. The increase in the ion concentration in a closed loop fluid stream may occur due to ion leaching from metals and nonmetal components that the coolant fluid is in contact with. During operation, the electrical conductivity of the fluid may increase to a level which could be harmful for the cooling system. Ion exchange resin can be used to remove the ionic substances that raise the electrical conductivity of the coolant in an electronics cooling application. They are bead like polymers that are capable of exchanging ions with ions in a solution that it is in contact with. In the present work, ion leaching tests were performed with various metals and polymers in both ultrapure deionized (DI) water, i.e. water which is treated to the highest levels of purity, and low electrical conductive ethylene glycol/water mixture, with the measured change in conductivity reported over time. Additionally, changes in the electrical conductivity of ultrapure DI water in an indirect, single phase, active cooling loop, with and without ion exchange resin are characterized with the findings reported. Finally, recommendation for design and estimation of the longevity of the ion exchange resin cartridge in an electronics cooling loop is discussed. In this section the experimental setup for measuring coolant electrical conductivity in both the ion leaching and closed loop indirect cooling experiments are described. Figure 1. Long-term ion leaching experimental setup. Premade mixture of 50:50 ethylene glycol and UP-H2O, and nonionic inhibitors (EG-LC). All fluid and test samples were placed in polytetrafluoroethylene (PTFE) containers which were cleaned with distilled water, alcohol, UP-H2O and dried in ambient atmosphere. PTFE containers were chosen over borosilicate glass because they contain strong, compact bonds which are excellent at maintaining their original crystallinity, therefore, exhibiting lesser ion leaching capacity to the base fluid. The containers were charged with either UP-H2O or EG-LC. Metal and polymer coupons were rinsed with distilled water, alcohol, UP-H2O and polished to remove excess surface debris. The materials were placed in the containers and sealed with PTFE thread tape and PTFE lids. The samples were allowed to equilibrate at room temperature for two days before recording the initial electrical conductivity. In all tests reported in this study fluid electrical conductivity was measured to an accuracy of ±1% using an Oakton CON 510/CON 6 series meter which was calibrated prior to each measurement. A furnace was preheated to 80°C in ambient atmosphere and verified for heating uniformity to ±1°C at different locations, i.e. from the wall heating coils to the center of the furnace. The PTFE sample containers were placed in the furnace when steady state temperatures were reached. The test setup was removed from the furnace every 168 hours (seven days), cooled to room temperature with the electrical conductivity of the fluid measured. The time taken for the samples to cool, measure electrical conductivity, and place back in the oven was generally less than four hours. The electrical conductivity of the fluid sample was monitored for a total of 5000 hours (~208 days). Figure 2. Schematic of the indirect closed loop cooling experiment set-up. Table 1. Components used in the indirect closed loop cooling experiment that are in contact with the liquid coolant. A schematic of the experimental setup is shown in Figure 2. Table 1 lists the components used for which the liquid coolant made direct contact with. Before commencing each experiment, the test setup was rinsed with UP-H2O several times to remove any contaminants. The system was loaded with 230 ml of UP-H2O and was allowed to equilibrate at room temperature for an hour before recording the initial electrical conductivity, which was 1.72µS/cm. Fluid electrical conductivity was measured to an accuracy of ±1%. After the initial measurements, the copper cooling block was placed on a hot plate operated at 80 °C. During operation the fluid reservoir temperature was maintained at 34°C. The change in fluid electrical conductivity was monitored for 136 hours. The fluid from the system was collected and stored. Similarly, closed loop test with ion exchange resin was carried out with the same cleaning procedures employed. The initial electrical conductivity of the 230ml UP-H2O in the system measured 1.84µS/cm. An ion exchange resin cartridge (diameter = 38.1mm, height = 50.8 mm) containing 20g of Dowex mixed bed resin was installed in the fluid loop. Table 2. Test matrix for both ion leaching and indirect closed loop cooling experiments. 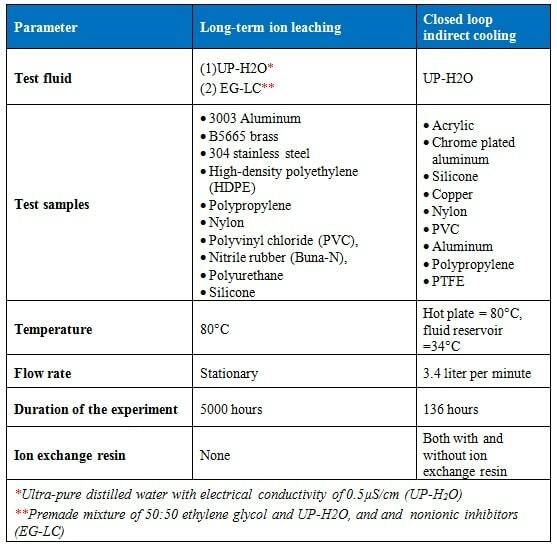 Table 2 shows the test matrix that was used for both ion leaching and closed loop indirect cooling experiments. NaCl solution having an electrical conductivity of 11.82µS/cm. 0.1g of Dowex resin was added to 100g of fluid samples that was taken in a separate container. The mixture was stirred and change in the electrical conductivity at room temperature was measured every hour. The measured change in the electrical conductivity of the UP-H2O and EG-LC test fluids containing polymer or metal when immersed for 5,000 hours at 80°C is shown Figure 3. To place in context the measurement results, the electrical conductivity of drinking water is typically less than 500µS/cm, river water between 50 to 1500µS/cm, industrial water less than 10,000µS/cm with seawater typically less than 50,000µS/cm . Figure 3. Ion leaching experiment: Measured change in electrical conductivity of water and EG-LC coolants containing either polymer or metal samples when immersed for 5,000 hours at 80°C. The results indicate that metals contributed fewer ions into the fluids than plastics in both UP-H2O and EG-LC based coolants. This could be due to a thin metal oxide layer which may act as a barrier to ion leaching and cationic diffusion. 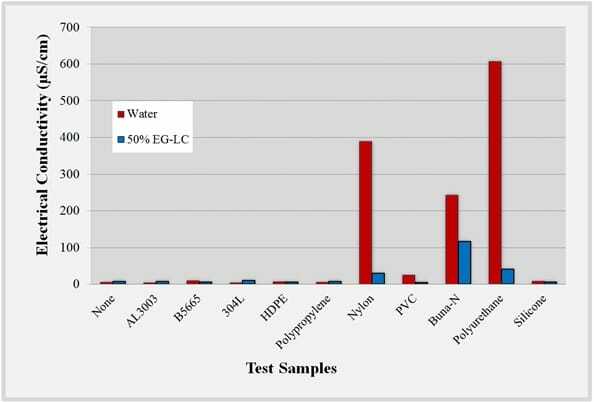 Both UP-H2O and EG-LC fluid containing polypropylene and HDPE test samples exhibited the lowest electrical conductivity changes. Fluids containing polypropylene and HDPE exhibited the lowest electrical conductivity changes. This could be due to the short, rigid, linear chains which are less likely to contribute ions than longer branched chains with weaker intermolecular forces. Silicone also performed well in both test fluids, as polysiloxanes are generally chemically inert due to the high bond energy of the silicon-oxygen bond which would prevent degradation of the material into the fluid. It was observed that materials containing nitrogen groups, such as Buna-N rubber, polyurethane, and nylon had the largest electrical conductivity increases. It would be expected that PVC would produce similar results to those of PTFE and HDPE based on the similar chemical structures of the materials, however there may be other impurities present in the PVC, such as plasticizers, that may affect the electrical conductivity of the fluid. Additionally, chloride groups in PVC can also leach into the test fluid and can cause an increase in electrical conductivity. Figure 4 shows the before and after sample images of 5,000 hour testing of the metals and polymer samples, which was used in the ion leaching experiment. 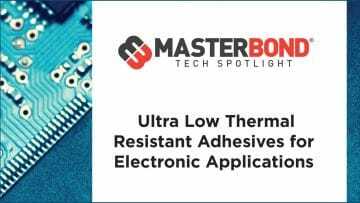 Buna-N rubber and polyurethane showed signs of degradation and thermal decomposition which suggests that their possible utility as a gasket or adhesive material at higher temperatures could lead to application issues. Polyurethane completely disintegrated into the test fluid by the end of 5000 hour test. Figure 4. Before and after images of metal and polymer samples immersed for 5,000 hours at 80°C in the ion leaching experiment. Figure 5. Measured change in the electrical conductivity of UP-H2O coolant as a function of time with and without resin cartridge in the closed indirect cooling loop experiment. The measured change in electrical conductivity of the UP-H2O for 136 hours with and without ion exchange resin in the loop is shown in Figure 5. 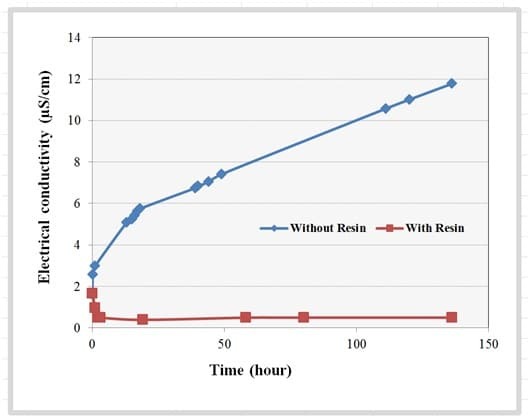 The electrical conductivity of the UP-H2O without resin cartridge increased by a factor of seven from 1.72µS/cm to 11.77µS/cm by the end of 136 hours of testing, an increase of approximately 1.77µS/cm per day. This indicates, during the course of the experiment, a constant ion leaching from the components when the fluid is in contact. The electrical conductivity of the UP-H2O in the loop containing the ion exchange resin cartridge consistently remained below 0.5µS/cm, indicating that the ion exchange resin was able to remove the ions that leached to the fluid stream, maintaining low electrical conductivity of the fluid during the duration of the experiment. Figure 6. Measured change in electrical conductivity of fluid samples as a function of time when stirred with the resin sample in the closed indirect cooling loop experiment. Figure 6 shows the change in the measured electrical conductivity of the fluid samples when stirred with the resin sample. The conductivity of the water sample from the closed loop experiment reduced by approximately 70% from 11.77µS/cm to 3.32µS/cm in six hours. 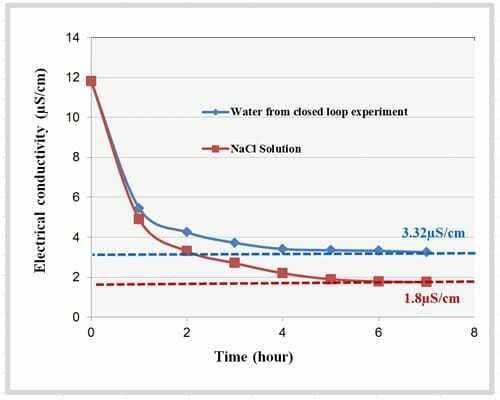 Whereas, the electrical conductivity of the NaCl solution reduced by approximately 85% from 11.82µS/cm to 1.8µS/cm in six hours. These results indicated that the capacity of the resin depends on the test fluid used for the experiment. This shows that different ions present in the fluid will result in different ion exchange capacity of the fluid. Therefore, calculating the ion exchange resin capacity with the fluid sample from the actual cooling loop is important. 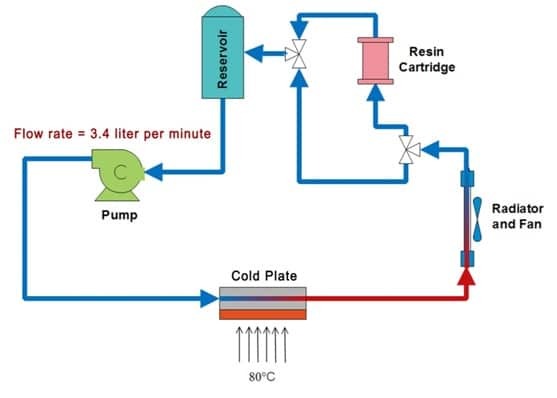 In order to calculate the accurate longevity of the resin cartridge that was used in the cooling loop experiment, the resin capacity with the water sample from the closed loop experiment was taken into consideration. Therefore, an ion exchange resin cartridge containing 20g of Dowex mixed bed resin may take on order 938 days to saturate. In other words, to maintain a low electrical conductivity, a resin cartridge with the dimension and weight specification as that of the resin cartridge used in the experiment, need to be changed every 30 months for the cooling system that was used in the experiment. The long term ion leaching experiment showed that an increase in the electrical conductivity of the coolant fluid is contributed by ion leaching of both metals and polymers that were used in the closed loop cooling system. By determining both the rate of increase in the electrical conductivity and the ion exchange capacity of the resin with the ions in the fluid used in the cooling system, the estimation of the longevity of the resin cartridge in an electronics liquid cooling loop can be calculated. Incropera, F., Liquid Cooling of Electronic Devices by Single Phase Convection, New York: John Wiley & Sons, 1999, pp. 1-14. Mohapatra, S., “An Overview of Liquid Coolants for Electronics Cooling,” Electronics Cooling, May 2006. Mohapatra, S. and Loikits, D., “Advances in Liquid Coolant Technologies for Electronics Cooling,” Proceedings of the 21st IEEE Semiconductor Thermal Measurement and Management Symposium, San Jose, CA, 2005, pp. 354-360. United States Environmental Protection Agency, “Water: Monitoring & Assessment,” http://water.epa.gov/type/watersheds/monitoring/2015, Last accessed November 15, 2015.